Disclosure-No compensation was received. Informational post only. Any opinions stated are always my own. 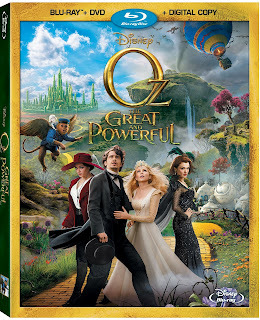 Disney’s “Oz The Great and Powerful” will once again provide audiences with a magical entertainment experience when it debuts for in-home release on Blu-ray™ Combo Pack, DVD, Digital and On-Demand, June 11, 2013. A must-own for any home entertainment collection, the Blu-ray Combo Pack (Blu-ray + DVD + Digital Copy) of “Oz The Great and Powerful” brings the epic adventure to life with its vibrantly colorful picture and sound, and boasts a sensational variety of never-before-seen bonus materials including: “The Magic of ‘Oz The Great and Powerful’ Second Screen Feature” that provides viewers with an immersive opportunity to journey into the fantastical lands of Oz; James Franco’s personal story of his journey to the land of Oz that is produced and directed by the Oscar® nominated star himself; Golden Globe® nominee Mila Kunis’ makeup metamorphosis which is hosted by Academy Award®-winning makeup artist Howard Berger; A back-stage journey through each of the visual effects process that brought China Girl to life including an interview with Joey King; and much more. 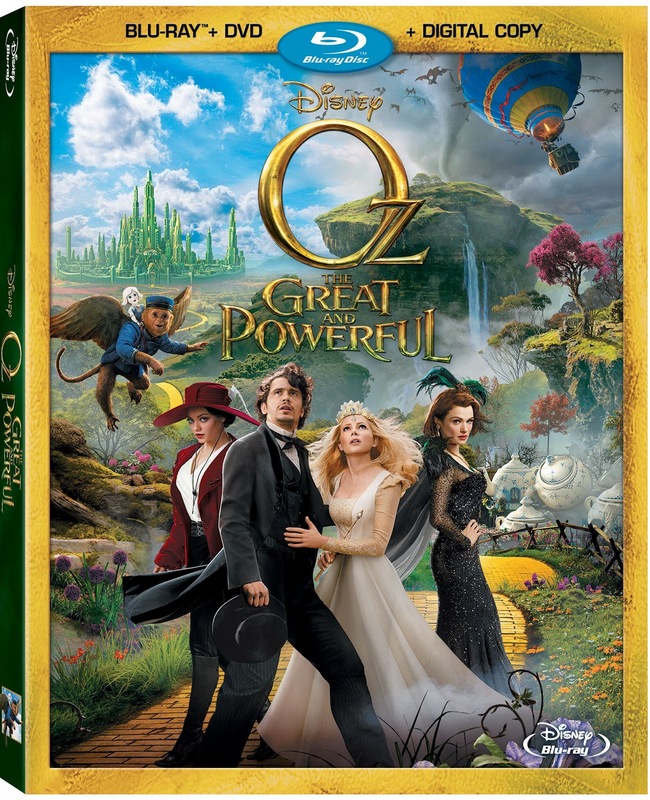 Additionally, all Blu-ray and DVD products include a digital copy of the film allowing consumers to watch “Oz The Great and Powerful” at home, in their car, and/or anywhere they go. The film is directed by Sam Raimi who helmed the record-crushing “Spider-Man” trilogy, and produced by Joe Roth who fashioned Disney’s billion dollar-plus earning “Alice in Wonderland.” “Oz The Great and Powerful” boasts a stellar cast that includes Academy Award nominee James Franco (“127 Hours”) as Oscar Diggs, the predestined wizard; Golden Globe nominee Mila Kunis (“Black Swan”) as the tormented young witch Theodora; Academy Award winner Rachel Weisz (“The Constant Gardener”) as Theodora’s older sister, Evanora, the witch who rules over the Emerald City; and three-time Oscar-nominated actress Michelle Williams (“Brokeback Mountain,” “Blue Valentine,” “My Week with Marilyn”) as Glinda, the Good Witch. -The Enchanting Characters and Creatures of Oz - From Munchkins and Tinkers to good witches, bad witches, and flying baboons, this piece follows each character and creature of the Land of Oz from inspiration to final outcome. -The Sounds of Magical Oz - What adds fragility to the sounds of China Girl's footsteps; ferocity to the tornado; or weight to the flutter of Finley's flapping wings? -Sleight of Hand: Zach Braff Puppet Theater - Actor, and voice of Finley, Zach Braff introduces viewers to the Finley mockup. -My Journey in Oz by James Franco - A personal story produced and directed by James Franco. - China Girl and the Suspension of Disbelief - This feature uncloaks the several forms of movie magic employed to bring China Girl to life, from the initial artwork and character design, to the on-set puppeteering during filmmaking, and finally, through each stage of the visual-effects process; and includes an interview with Joey King, the voice of China Girl. -Before Your Very Eyes: From Kansas to Oz - Production designer Robert Stromberg takes viewers through the set design of the Land of Oz, from sketching his original ideas on a napkin, through to the final set pieces and the accompanying visual effects. - Mila’s Metamorphosis - Lead makeup artist Howard Berger expands on one of the oldest, most tried-and-true forms of movie magic: makeup design and effects. - Walt Disney and the Road to Oz - It is well known that Walt Disney had a fascination with the Land of Oz since he was a child. See how that fascination grew into inspiration as he began planning for his own adaptation of the stories in the classic Baum books.